The 27 metre (88’) Sunseeker motor yacht Firecracker is offering a 10% charter discount during the month of May in the South of France. A luxurious interior accommodates eight guests in four cabins consisting of a full beam master suite, full beam VIP suite, a twin and a double convertible to a twin, all with en suite bathroom facilities. A bright and airy saloon has excellent views through large windows, comfortable seating on soft settees in neutral colours in front of an entertainment centre including a 50 inch Sony television screen and Bose stereo surround sound, and a formal dining area seating eight guests. Lovers of the outdoors will be delighted with the al fresco options available, including sunbathing areas on the aft deck and foredeck. In addition, a Bimini top can be raised over the foredeck to provide welcome shade. 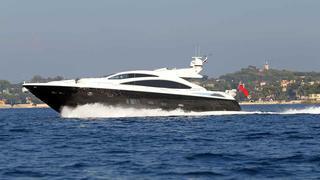 Her sports flybridge, too, offers ample sunbathing areas on which to relax and watch the French coastline speed by. Twin 2,640hp MTU engines give her a comfortable cruising speed of 22 knots and she is fitted with zero speed stabilizers to eliminate roll motion in sea and in port. Additional amenities comprise full air conditioning, a water maker, ice maker, WiFi internet access throughout and a hydraulic swim platform. Water toys include a Williams 385 jet tender, two SeaBobs, snorkeling gear and a range of towables including water skis. Firecracker is available for charter through Bluewater at €48,000 per week in high season and €43,000 per week in low season, plus all expenses.